PJohnson & Johnson, New Brunswick, NJ. The hemostatic action of cellulose requires a functional clotting cascade and the presence of all clotting factors. All sorts of hemostatic agents have been experimented with and documented during laparoscopic partial nephrectomy. The use of agents designed to augment standard methods for optimizing hemo-stasis is warranted during several urologic and laparoscopic procedures. Because the acidity of oxidized cellulose inactivates thrombin, thrombin and cellulose should not be used together. Cellulose has no adhesive properties and is only used to better establish hemostasis. 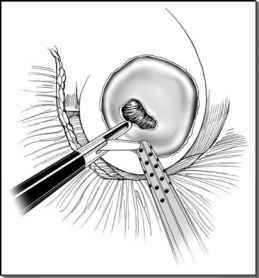 In urologic laparoscopy, cellulose generally is applied after nephrectomy to control persistent bleeding from the raw edge of a spared adrenal gland or during partial nephrectomy for packing the newly created divot in the renal parenchyma. contaminant transmission and enhances hemostasis by contact activation of the intrinsic coagulation pathway. Also, its swollen gelatinous mass may hold clotting factors in the region of bleeding and augment clot formation. The cellulose is completely absorbed with time (7-14 days) without significant tissue reaction. Surgicel™r and Oxycels are available in varying-sized cloth-like sheets that can be passed easily through laparoscopic ports. Because cellulose will adhere strongly to any moist tissue, careful maneuvering is required to place it precisely on the desired location. Cellulose has no adhesive properties and is only used to better establish hemostasis. In urologic laparoscopy, cellulose generally is applied after nephrectomy to control persistent bleeding from the raw edge of a spared adrenal gland or during partial nephrectomy for packing the newly created divot in the renal parenchyma (37). When used as a bolster over which to suture the renal capsule, the cellulose can be rolled up and held in position with a 4.0 Vicryl suture at either end. The swelling of the cellulose upon contact with blood allows it to generate a tamponade effect similar to gelatin. Caution should be taken in situations where a confined space is involved. Several cases of neurologic injury, such as acute paraplegia, have been reported after application of cellulose. It was postulated that the migration of the cellulose into the epidural space caused spinal cord compression. Conceivably, overly enthusiastic application near the ureter or renal vessels could result in obstruction.